Yay. Shiny new distraction replacing old crummy distraction. There’s an extremely good chance I’m building it in the near future after the OG mini restoration. The pencils feel very very solid as all get out, the mechanisms are smooth and without play, however, when writing words and not drawing lines, the eraser cap makes some little ticking noises as it moves about due to the tip extended and a bit of slack up there; slack only with the cap. But really, using these things for writing words is like using a hammer to screw things. (Like my father-in-law did when setting up the Christmas tree stand) Not the intended purpose. We draw and sketch and think about creations with these, we write thoughts with quality pencils (Mitsubishi 9850 and Blackwing 602's) and pens (energels are my go to now). Eh, too much criticism; These are one of the most usable and solid pieces I’ve ever used. 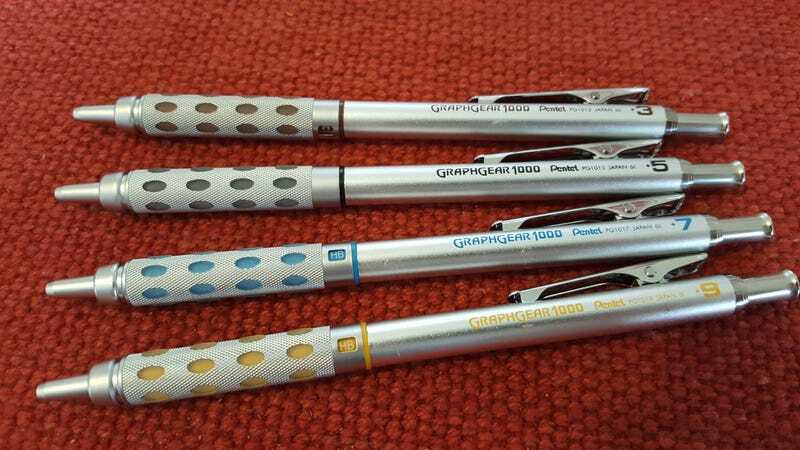 A Rotring may feel ultimately more perfect in the hand but it’s also 3x more expensive for one than all four of these. So get some!